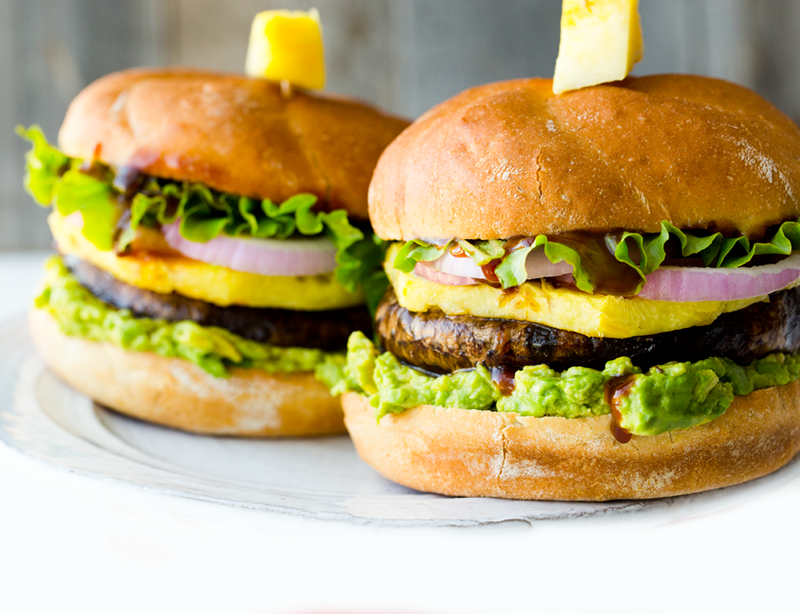 Today I am sharing my DOLE Pineapple Teriyaki Portobello Burgers, with avocado, made using homemade teriyaki sauce and freshly sliced, juicy-sweet pineapple rings. I slathered my portobello mushroom caps in teriyaki sauce and roasted them in the oven to perfection. 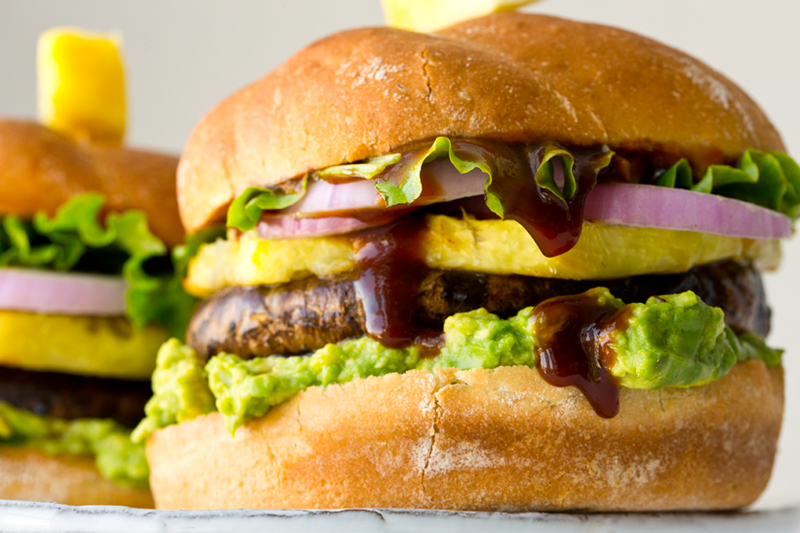 So much juicy flavor in each bite of this monster veggie burger! 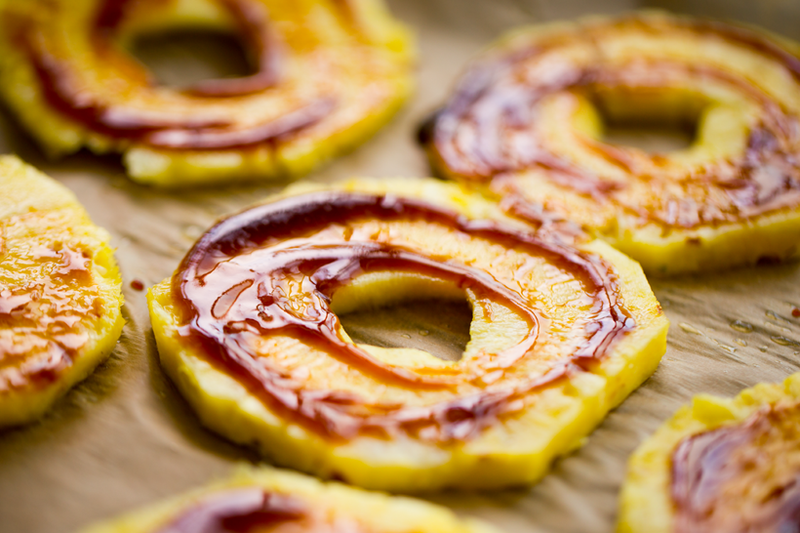 Pineapple rings, hand-cut. I can always count on DOLE to have a seriously sweet and juicy golden pineapple. The 2016 Get Up and Grow! Tour..
DOLE is at it again! 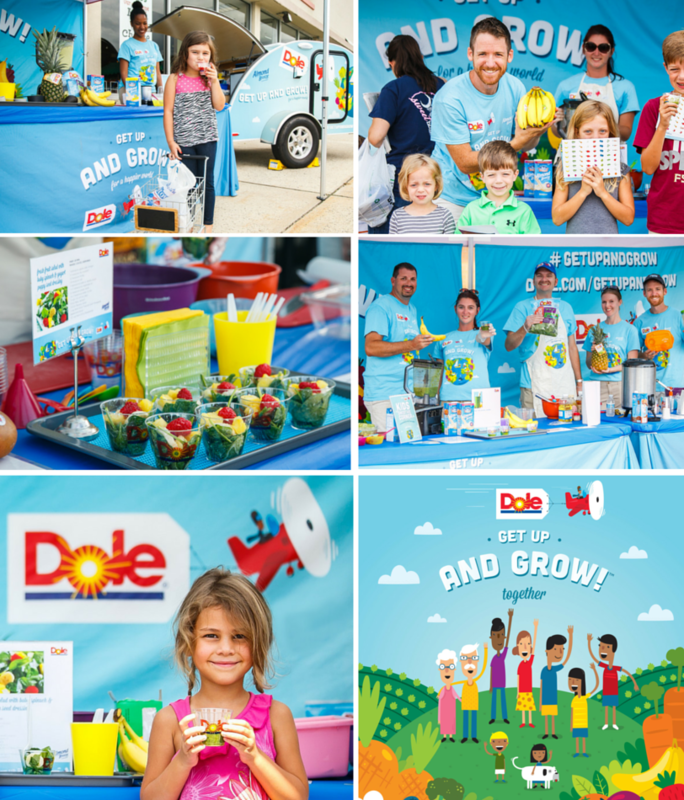 Last year, I chatted about DOLE's Get Up And Grow! Tour and Program. And they are at it again since last year's program was such a success. The program inspires everyday folks like you and me to eat more fruits and veggies and engage in healthy lifestyle activities. Everything from strength, endurance, dance moves, yoga poses, laughter, family time, vacation time and of course more plants on the plate! I love the 'boots on the ground' interaction of this campaign. So often campaigns like this stay online and on a screen. But DOLE takes passionate people and puts them in front of supermarket shoppers (and more) and educates them on how delicious and easy eating more fruits and veggies can be. Learn more here and take the pledge for a healthier you! And there are some fun DOLE online activities too... Check out the National Eat More Fruits and Veggies Day Twitter Party with @DoleTweets and @StephenGlickman on May 26 from 8-9PM EST. Stephen will be answering questions and there will be prizes too! And finally, DOLE was kind enough to offer YOU guys a pretty cool giveaway prize today. Check it out and enter at the bottom of the post..
* DOLEopoly --- this is a real live board game featuring the DOLE pineapple plantation story! This is amazing and totally worth entering. I mean, board games are making a comeback, right? And now lets get to the recipe.. 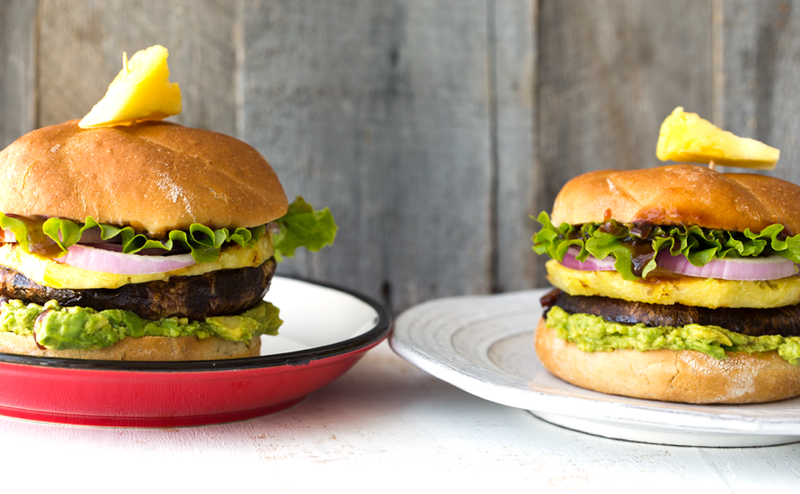 These flavorful veggie burgers are made using portobello mushrooms and mashed avocado and a DIY teriyaki sauce. 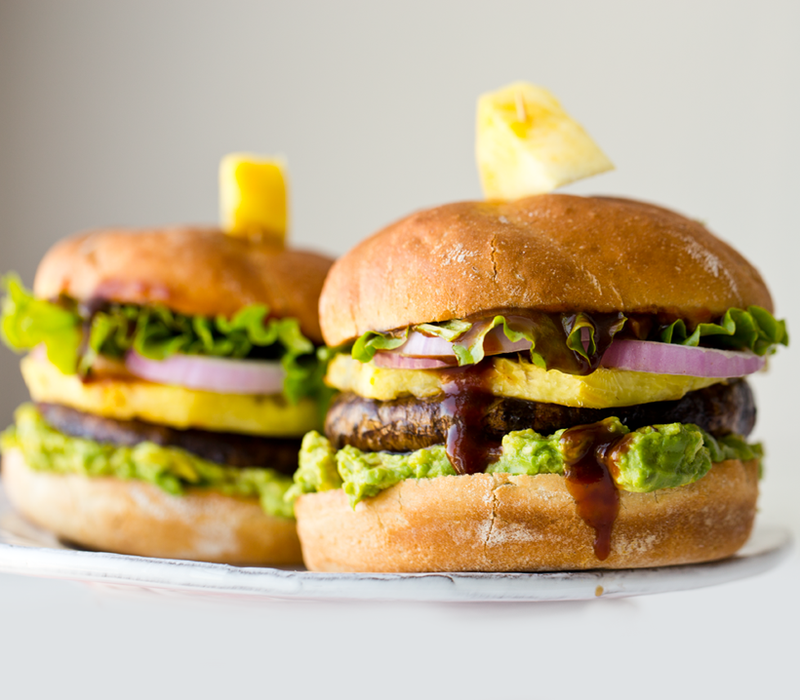 For burger sauce: You can either do 100% teriyaki, or "teriyaki ketchup" which is 1/2 teriyaki sauce 1/2 ketchup -- I did the ketchup version and loved it! 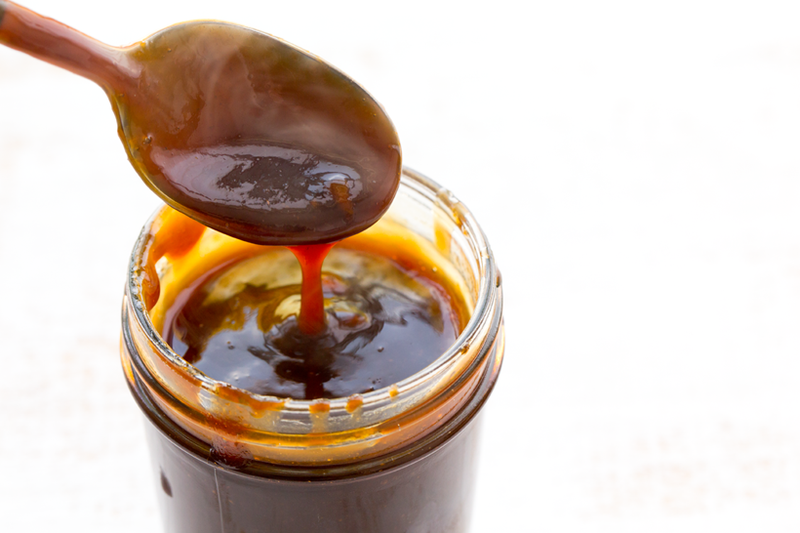 To make your teriyaki sauce, add all ingredients to a small sauce pot. Whisk well. Then place over medium heat and continue whisking briskly until the sauce begins to thicken - tis should take 4-5 minutes. Turn heat to low and continue whisking for another minute and then turn off heat and set aside. Tip: add more sugar if you like a sweeter sauce. 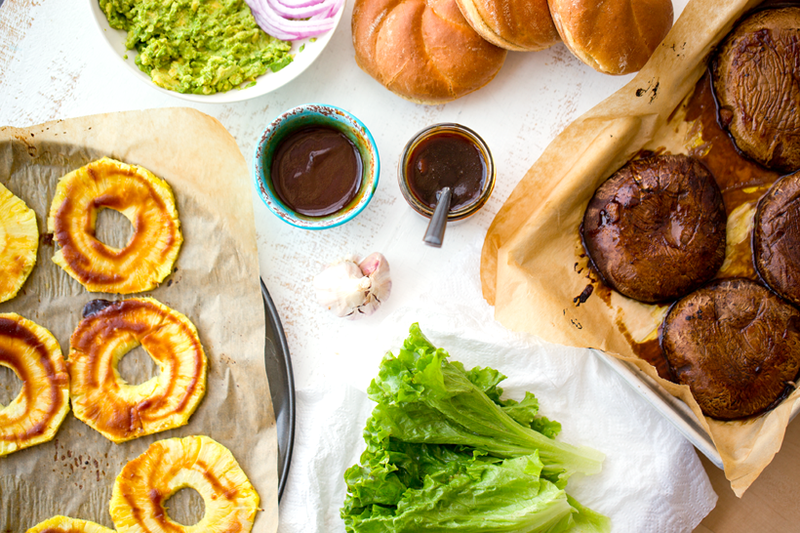 Prep your pineapple, onion, lettuce and portobellos. 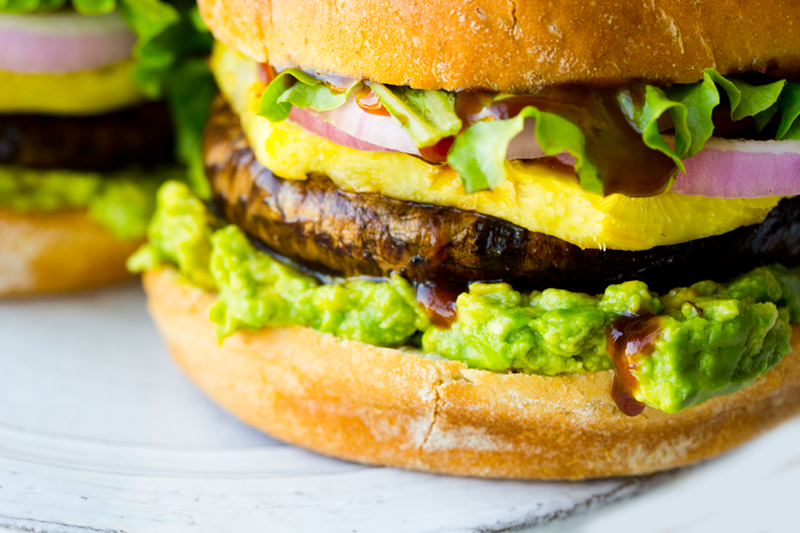 Mash your avocado. Turn oven to 450 degrees. Layer two baking sheets with parchment paper. On one, add the sliced pineapple. On the other, the mushrooms. Lightly brush the pineapple with teriyaki sauce. Heavily brush the portobellos with sauce. 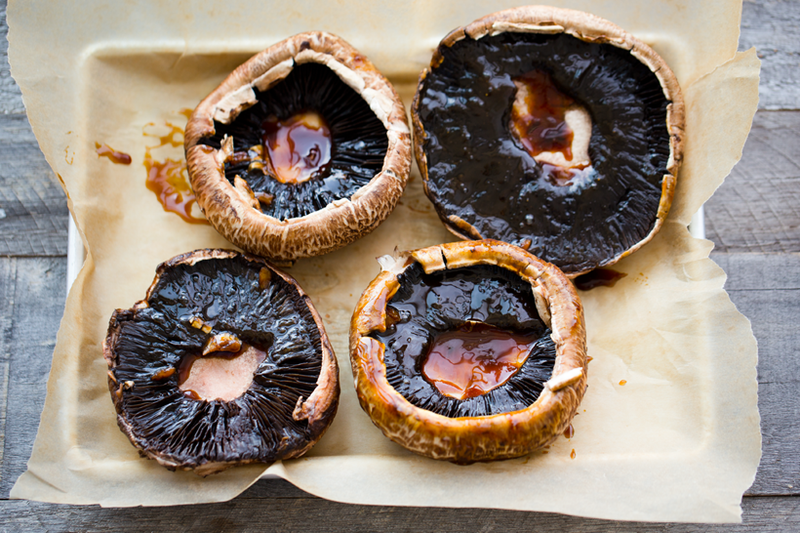 Tip: Use a rimmed baking sheet or a glass baking dish for the mushrooms, since they get juicy. I added about 1 tsp sauce to each side of the mushrooms. Bake pineapple for about 10 minutes, just until they soften and caramelize a bit. Bake the mushrooms 18-20 minutes, or until they are super tender. If needed, flip mushrooms half way through and re-brush with sauce. About 5 minutes before mushrooms are done, place your buns in the oven to warm them. 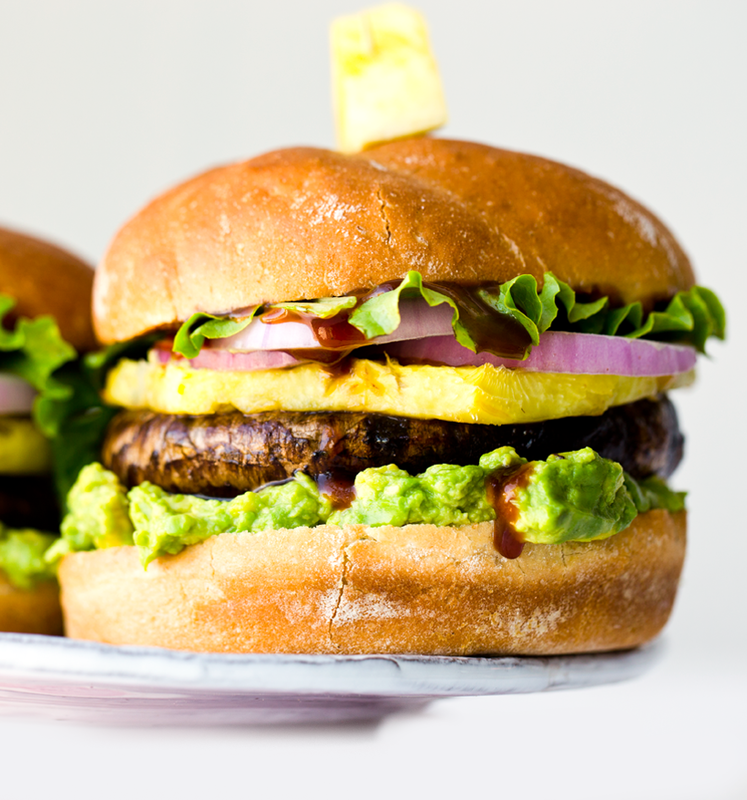 Assemble burgers: Add a layer of mashed avocado. 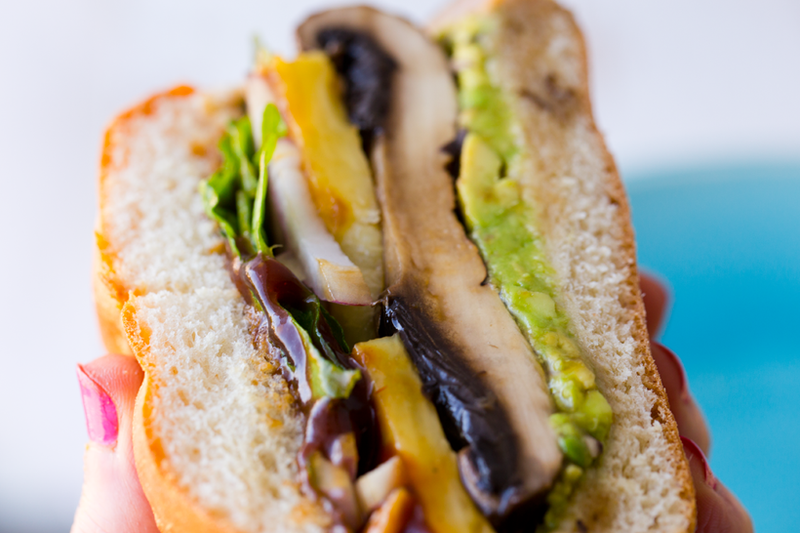 Then a portobello cap. Then one or two pineapple rings. 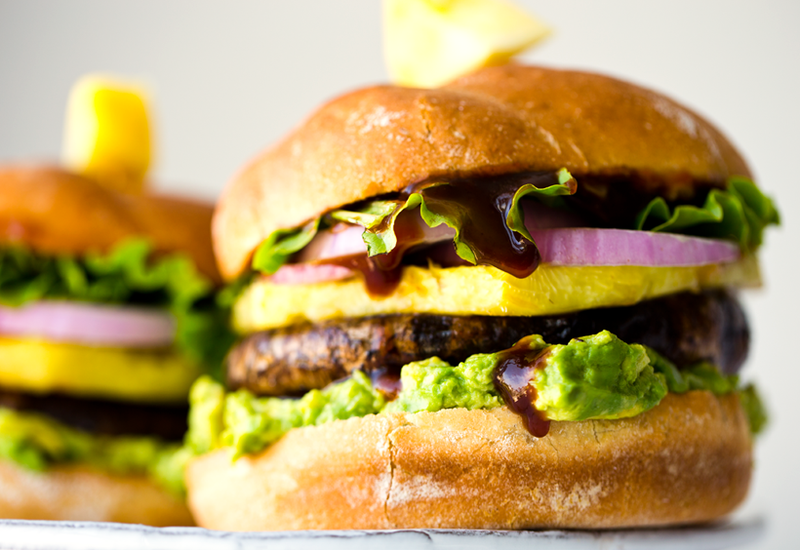 Then onions and lettuce and finally, a teriyaki sauce slathered top bun. Serve warm!